Nevertheless, only two poems by Perks were set to music by Diepenbrock: Avondzang (Evening Song, 1885) and Zij sluimert (She Slumbers, RC 51, 1900). Diepenbrock’s surviving correspondence contains no information about or references to the genesis of Avondzang; there is no documentation on the revision of March 1896 either. The intimate, dreamlike atmosphere of the sonorous poem (for the most part Perk used voiced consonants) about a peaceful encounter with a lover, would have appealed to him. 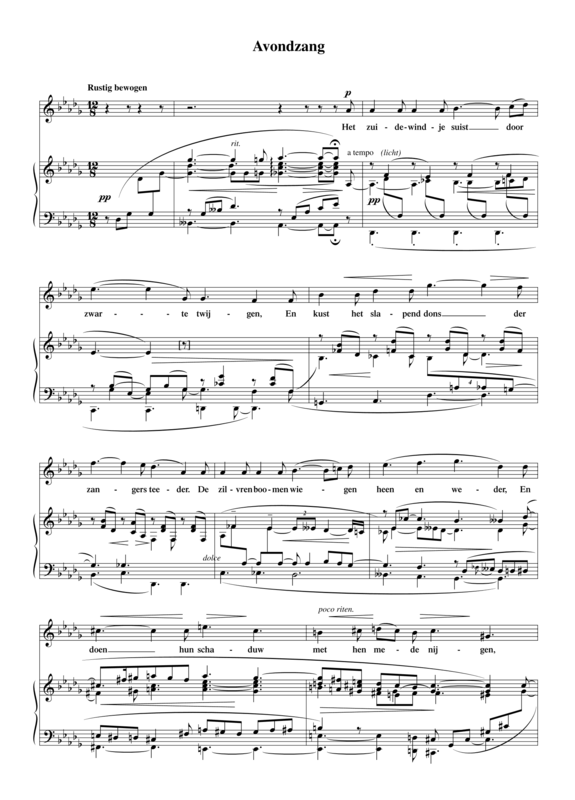 The setup of the song is simpler than that of Diepenbrock’s other early songs for tenor: a lyrical melody (never louder than a brief two-measure mf) in the voice in quiet 12/8 time above a harmonically rich piano part, which occasionally presents a countermelody. In 1905 Avondzang was published by A.A. Noske together with nine other songs. When correcting the proofs, Diepenbrock received a lot of help from Johanna Jongkindt (1882-1945), who carefully went through the piano parts. Of all the songs in this edition, the composer chose to dedicate Avondzang to her, because of the text, which contains an indirect declaration of love . (BD VIII:356) In the edition a German translation has been printed beneath the Dutch text. This translation by F. du Pré (trombonist in the Concertgebouw Orchestra who also frequently worked as a copyist) was authorised by Diepenbrock. Through mediation of the writer H.J. (Hein) Boeken, an Italian translation was made in 1917 by Pietro Mariatti (1877-after 1926), a linguist who resided in the Netherlands during the First World War. 1 Diepenbrock made this statement in a draft version of his contribution ‘To Willem Kloos’ for the Gedenkboek 1885 – 1 October – 1910 (Chronicles 1885 - 1 October - 1910) of De Nieuwe Gids; see VG:332-338 and 408 (footnote to no. 56). Is de liefde dwaling, kan men zoeter dwalen...?